WAGHENAER -Zee Kaerte van Bretaigne, Inhoudende die zee Custen, Bayen, Eylanden ende havenen tusschen Rouscou ende Groye. . .
WAGHENAER, L. J. - Zee Kaerte van Bretaigne, Inhoudende die zee Custen, Bayen, Eylanden ende havenen tusschen Rouscou ende Groye. . .
Zee Kaerte van Bretaigne, Inhoudende die zee Custen, Bayen, Eylanden ende havenen tusschen Rouscou ende Groye. . . - WAGHENAER, L. J. Title : Zee Kaerte van Bretaigne, Inhoudende die zee Custen, Bayen, Eylanden ende havenen tusschen Rouscou ende Groye. . .. Description :A detailed chart of the southern coast of Gulf of Biscay from Brest untill the mounth od the river Loire. Decorated by a very colourful title cartouche and scale cartouche, one compass rose, several vessels and sea monsters. A very early edition rare Latin text edition of this landmark contribution to the science of navigation. 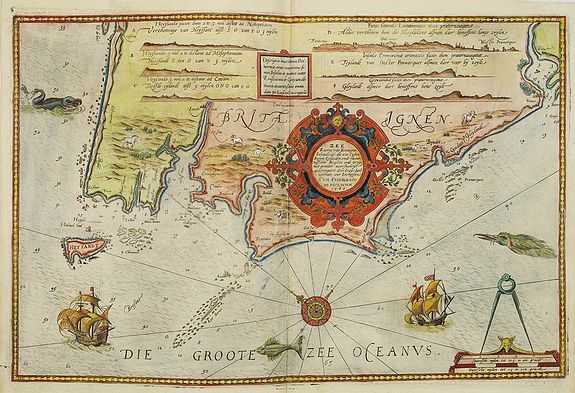 Waghenaer''s own personal experiences as a pilot along European coasts were used to compile the Spiegel der Zeevaerdt, the first edition of which was published in Dutch at Leyden in 1584/85 by the house of Plantin. Although advertised as published in 1584 according to Koeman this edition is more likely printed in 1585.